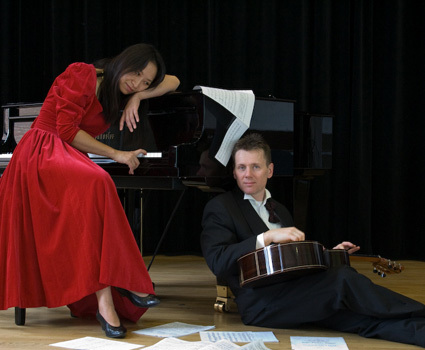 Bekkers Piano Guitar Duo returned to Houston in 2010 and appeared on Houston Public Radio KUHF Front Row Programme for the second time with previews of their forthcoming second CD Winter! What a surprise to discover Houston Public Radio KUHF chose us for their final programme of the Front Row in 2010! We had pre-recorded it on Friday 12th November 2010, a busy day that began at 6:30 am with interview at another Houston radio station, followed by a free public concert at the MD Anderson Cancer Center. The program previews our forthcoming CD Winter — which follows our first CD Summer! The producer Bob Stevenson asked us to play the first and last (skipping the slow second) movement of Vivaldi’s Winter from his Four Seasons. We gave this programme during 2010 in the Netherlands and on our 5-week USA tour. Included on this show was a short guitar solo cadenza of the Dutch national anthem which Robert invented for the lengthy Grand Potpourri National. The other original work for piano and guitar was the second half of Amsterdam-based composer Gijs van Dijk’s “Abstract and Dance.” Robert Bekkers had arranged Handel’s Arrival of the Queen of Sheba (first piece on the KUHF programme and played in its entirety). Another arranged piece for our duo was Fritz Kreisler’s version of Manuel de Falla’s Spanish Dance from La Vida Breve which we both adapted for piano and guitar (also the entire piece). What’s interesting about this recording session was that we were playing to an invisible and unknown audience that would listen in the future — an unknown date in the future on which it would be broadcasted and an unknown date on which people would listen online. There was no applause in the recording studio of the radio station. You could say we had only two people in the audience in the studio: the producer Bob Stevenson interviewing us, and sound engineer Todd Hulslander on the other side of the glass window. Some corrections: I didn’t graduate from Utrecht University but Utrecht Conservatory in 2008, two completely different institutions both located in Utrecht, Netherlands. Robert mentioned he had to bring down “Winter” one whole note — what he meant was whole tone — a Dutchism. 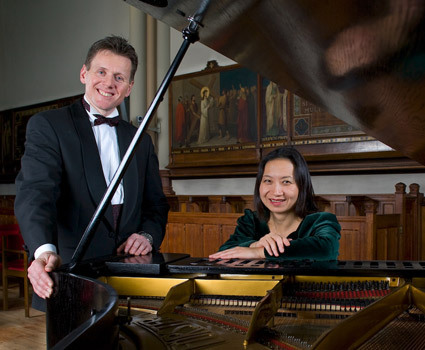 The radio programmers chose a photo of us taken by the Dutch photographer Humphrey Daniels in a monastic church in Warmond, Netherlands where we had recorded a concert towards the end of 2008. One of those pieces (recorded by Dutch sound engineer Boy Griffioen) found its way to our first CD Summer — Romance from Mozart’s Eine Kleine Nacht Musik, arranged for our duo by Robert Bekkers. We noticed a huge difference between our second recording at KUHF in 2010 and the first in 2007! The first live recording and interview in December 2007 was also the first time Robert and I had ever appeared on radio. We thought we would pre-record it and thus arrived an hour early. Little did we know that it was going to be a LIVE broadcast! We were less talkative and less knowledgeable about being interviewed in 2007.